Classic car website - recent updates. Homepage. 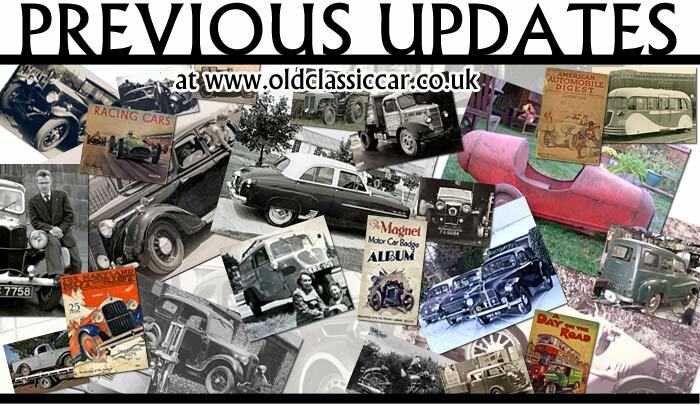 This page: An archive detailing recent updates to this vintage & classic motoring site. As new & updated classic & vintage car pages are added to the site, they'll continue to appear in the "What's New" section on the homepage. As newer items are added, and previous entries drop off the bottom of the list, they'll now be added into this archive of site updates, starting from 1st January 2014. Updates made prior to this date are no longer included on this page. 18 Jan 2019 Simca 9 Aronde Traffic collision in 1950's Paris maybe? 12 July 2018 Hednesford Raceway Programme from 1971 for a series of races in Staffs. 09 May 2017 Austin 8 tourer Photo of 'EUR 398' added, where is this car now? 04 October 2016 Morris J2 news Ex-RAF Fitter recognises his old Morris van on OCC! 19 May 2016 Vintage char-a-banc Does anyone recognise this vehicle's operator? 26 April 2016 Edwardian two-seater Is this a 12hp Sizaire-Naudin or another car? 12 February 2016 Steam lorry Can anyone identify this ancient machine? 06 Mar 2015 Fordson E494C van Photos of a Fordson added - does it survive? 06 Jan 2015 More '50s tax discs Examples of 1956-9 tax discs for agricultural veh. 26 Nov 2014 MG M-Type Midget Can anyone shed light on where this MG is now? 11 Feb 2014 Austin 7 Chummy Added, '30s photo of a Chummy, location?